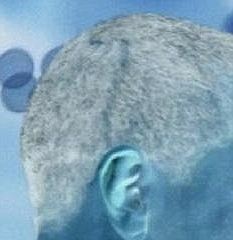 Mystery scars on Obama's head prompt another question from conspiracy theorists - has the President had brain surgery? He has been plagued with questions and doubts concerning his background throughout his first term as President. Questions like - is Barack Obama actually American? Is he a Muslim? Is he actually an alien from another planet? - have frequently been asked. The next question circulating on the internet - has President Obama had brain surgery? Internet blog sites, conspiracy theorists and forums are awash with rumours as to what those mystery scars on the president's head are from. 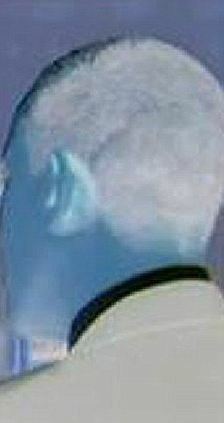 In pictures, Obama appears to have a long scar which goes up the side of his head and over his crown. Some conspiracy theorists claim they are scars that you would see on someone who has had brain surgery. But without medical records (along with his school records and birth certificate) no one seems to be able to provide an answer as to the cause of the mystery scars. Ben Hart, a blogger for Escape The Tyranny a website which presents itself as a Social Network & Forum For Conservatives, said: 'Obama's almost done with his first term, and we still know almost nothing about the background of the President of the United States. 'Whatever happened to create that scar, it was clearly something serious. Was it a brain operation? Has it affected his thinking? He also said that surgery might explain why the President gets lost speaking without a teleprompter, and posted a video of Obama struggling through a speech, repeating his words and getting lost mid-sentence. Speculation about different aspects of Obama's life first gathered momentum when questions over his actual birthplace started to emerge, with many believing he was born in Kenya rather than Hawaii, as he has stated. Millions of dollars have allegedly been spent trying to ensure that it is not released to the public, not even the Hawaiian governor has access to it. Added to that are the fact his medical records have also been sealed. A spokeswoman from the White House said they were not willing to comment on such claims, saying they were 'ridiculous'. Countless neurosurgeons said it is 'not their place' to comment on whether or not distinctive scars on the President's head are as a result of brain surgery. Others offered explanations such as a bad haircut or even a birthmark though many did agree that the scars are similar to those a produced after major brain surgery. Without medical records or an admission from the White House, the public may never know the answer to the question, along with the contents of his birth certificate. Re: Mystery scars on Obama's head prompt another question from conspiracy theorists - has the President had brain surgery?